As the winter sports season has just come to a close, it is only logical that someone writes a piece about what it is like being a varsity athlete. TASIS has junior varsity and varsity level teams for various sports, which are divided into three seasons. The winter season sports typically include basketball, badminton, cheerleading, skiing, and (most importantly) swimming. I had the privilege of serving as the Varsity Swimming team’s captain this season, and here is my top 10 list highlighting the best parts about being on the team (in no particular order). Every memory you get is immortalized in the photos you take. Every win and every loss and each one of your times exist as pictures. They range from serious to goofy, from Yearbook appropriate to ones with people kissing their biceps to make the photo fun. The photos serve as a reminder of the shenanigans the team has went through and as a testament to each our own personal stories, goals, and developments. See 2018 swimming photo galleries here and here. Nothing feels better than hearing your teammates and yourself make clinking noises with every step out of the swimming pool when you’re on the way home. 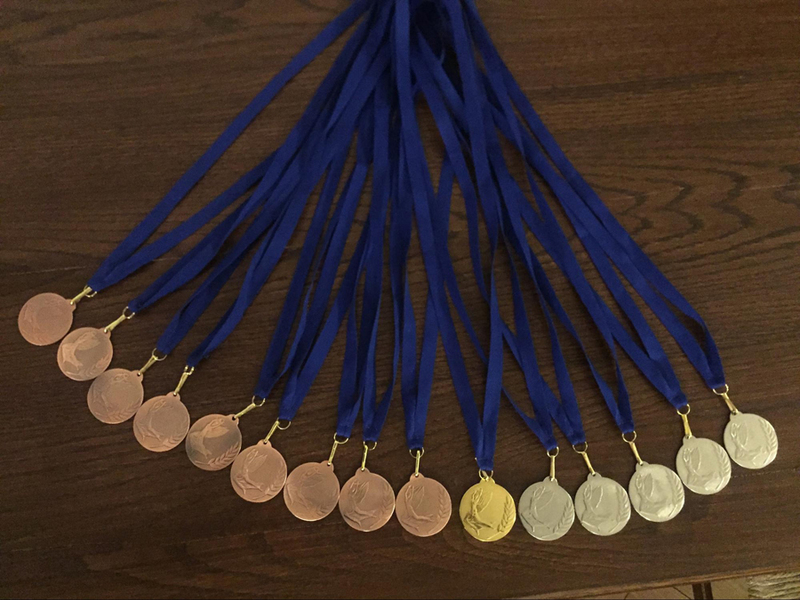 The medals and trophies are one of the most gratifying physical mementos of your time on the team, as well as of personal and team accomplishments. 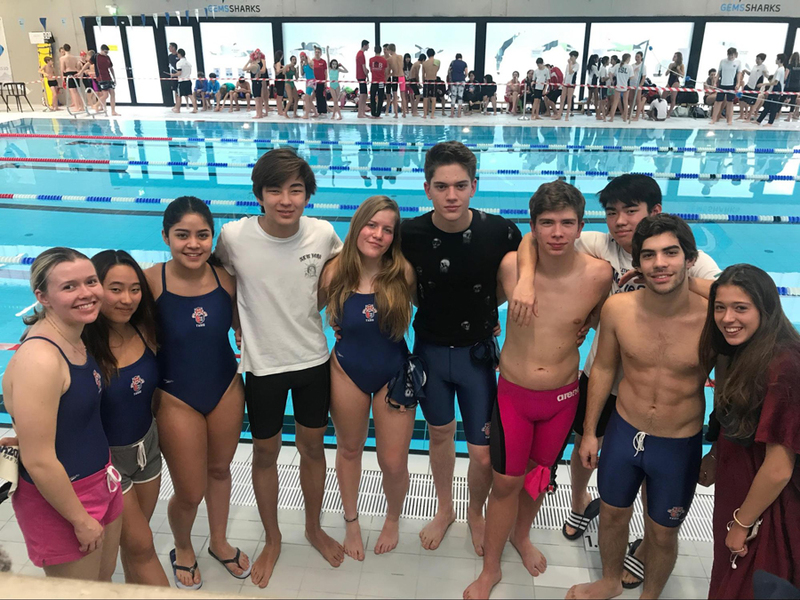 Being a varsity athlete is not only great for pushing your body to the limits and training it to be the best it can be, it’s also about putting maximum effort into every event you swim so that the team on the whole can succeed. It’s not all about winning—even though winning and trophies look and feel great—but rather about knowing that you have been pushed to the limit. While admittedly not every swimming team I’ve been a part of has had a group chat (it’s a recent development, but it has been extremely useful), it has come to be one of the best parts about growing as a team. Although it starts out awkward—no one really chats to others unless they were friends before joining the team—one of the funnest parts is getting to know each other. Training as a group, traveling together, and competing as a team is a lot of work but ultimately leads to bonding. You walk into tryouts as strangers, but you walk out of the last bus ride knowing the people beside you on a special level. You’ve seen them relatively naked, cheeks flushed and breathing hard after swimming a 700; you’ve shared good and bad decisions like getting McDonald’s after a swim meet; you’ve mixed up the order of the relay (I am still confused on how that happened). These people around you have seen you at your best, like after you got third in a 50 Fly. They have also seen you worried when you could not reach a teammate by phone and had to get to the train station ASAP so that you didn’t miss the train to the meet. The experience creates bonds that surpass the average friendship. The coaches deserve their own highlight. Truly, the role of a coach is underrated. They’re not only supposed to be ruthlessly pushing you to your limits by making you swim a 200 IM (that’s all strokes) when you have never before swum an individual medley in your life, but also supporting you so that you don’t run away and quit before it’s too late. They support you not only in the athletics—they also get to know you, watch you grow, and keep motivating you. They’re the people you can tell about your relationship troubles and open up to about memories or expectations, fears and worries, insecurities, and really anything else that comes up. They are the people who can give you a pep talk but also shoot you down when you’ve climbed too high on the ego ladder and need to be kept in check. And while they have their eccentricities—and like with any other person, you can fight with them, argue with them, and push their buttons (and they will do the same for you)—they leave you with a fuzzy warm feeling after the season is over. Whenever you look back on your journey as a varsity athlete, they are the warmth and support the memories radiate. This goes without saying. One of the funnest parts about being a varsity athlete is the competition. It’s the adrenaline, the blood pumping in your veins as you stand on the edge of the starting block, about to dive as soon as you hear the beep. While the meets are usually scary at first, once you get into the swing of it, they become easier. After five years of competing, I still look around nervously before my start to see if I’m doing the right thing so that I don’t get disqualified. While most people take the meets to be a place where you have to win things in order to be successful, it’s really not that simple. The meet serves to provide a place where under high-pressure conditions you try to do your best. Sometimes, the psychological part of the meets takes its toll—most of the teams have swimmers who swim for professional teams, with the teams themselves training every day all year while we train three times a week for barely two months—so you may hope to finish third in a race, but you find out quickly when you’re in the water that you’re about 20 seconds slower than the slowest swimmer on the other teams. Of course, I exaggerate, and this year we have been lucky to have quite a bit of our level swimmers, but it does make a difference. And the key to succeeding in meets is to take succeeding not as winning a medal but rather as setting a personal best. There are countless jokes about sack lunches. They remain the same no matter where you go or which team you go with, and you always know it’s a turkey salad sandwich, a tomato cheese sandwich, a cereal bar, a juice box, a piece of fruit, and a pack of mayo. So while the sack lunches themselves are not the best parts of the competitions, food itself is. Not only do you get to feast on junk food after a particularly daunting meet (do it at your own risk, because the heaviness that follows is not that fun to deal with), but you get to share your food experiences and preferences with other teammates, which then allows you to bond. Few things are better than sitting in a Starbucks drinking coffee with your teammates looking out on sunny Lucerne. And of those, we have a lot. The team experience is learning about other people’s sense of humor, which leads to hilarious incidents and inside jokes. Some of the jokes take on a more serious color—like losing one of your teammates in the train station before a meet or realizing you’ve left school an hour late and are still on your way while the warm-up for the meet has already started. Others are born out of necessity, like mimicking Coach Anklan’s “get in the water” with various degrees of annoyance. Some are born out of your brain being so tired that it stops functioning and you let out jumbled sentences that make absolutely no sense. But all of them lead to laughing and good-natured teasing, only bringing you closer to the people you share the laugh with. It seems counterintuitive, but the amount of work you do at practice and the effects of this work are also some of the best parts of the experience. While you cannot feel yourself sweat when you’re in the water (and you don’t smell of sweat after—a major perk), you still know you’re doing the work when the cold water of the swimming pool stops cooling you down. While you swim, it feels like your arms are made of wood, your lungs are collapsing, and your legs are cramping. Your muscles burn after a good training set, and the hot shower afterward feels like heaven on earth, especially if your shampoo smells great. Yet afterward, when you realize that your biceps are stronger and bigger than most of your peers’ and you look fabulous in a swimsuit, you understand what that pain has led you to, and suddenly it’s all worth it. Whenever you feel like giving up, it’s key to persevere and just keep swimming. One of the key experiences on a team is competing in tournaments that last more than one day. Usually you join families from the school that’s hosting the tournament and spend the night with them. It’s quite nerve-wracking at first—you don’t know how to act or if you’ll like the people you’ll stay with. Thankfully, you get a buddy from the team, which helps you feel safer because you’re with a person you know. The families that you stay with are usually extremely nice and do their best to make you feel welcome. 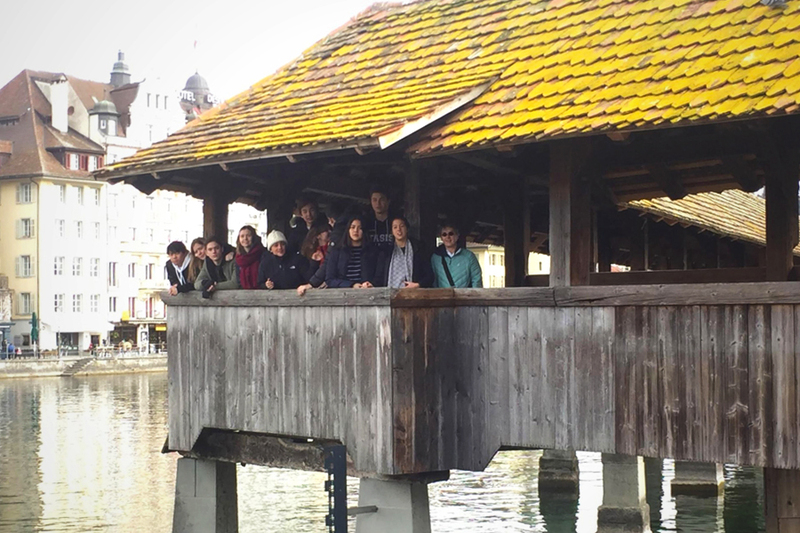 Having been a host for Lausanne’s team last year, I can say that some friendships that the homestay experience creates are wonderful and unique because you wouldn’t have met the people otherwise. These last ESC Championships, I saw a girl who I hosted last year, and we had a lot of fun catching up and talking. Being hosted by other families is also great, as you get to experience other lifestyles and meet people who are different from what you’ve known. What I really mean by this entry is that there are people who make being on the team extra fun. While some do it by pushing your buttons with their dry sense of humor and abominable attitude (Patryk) or by inexplicably doing things they will later regret and sharing them with the team (Zhan) or by simply being themselves and having their “white girl” moments (Kipi), the memories they create stand out like bright paints on a blank canvas. There are countless incidents, such as trying to take a picture and stepping into either soil or cow manure and then trying to take it off with a makeup-removing wipe, that make the experience unique. The people on the team are what really make the experience a fun one. 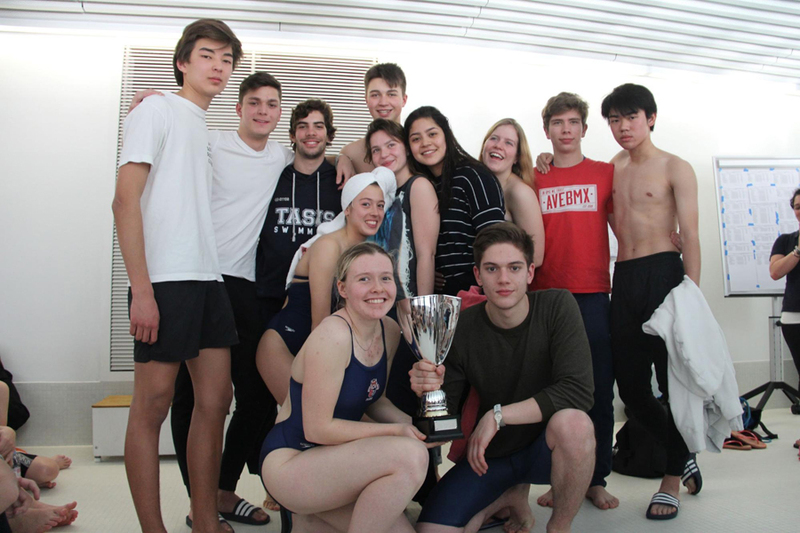 Photos from the season can be found on the TASIS SmugMug page.